Katsu now lives in the ideal home in the wine country of northern California. He is loved and treasured (described as a big loveable clown). 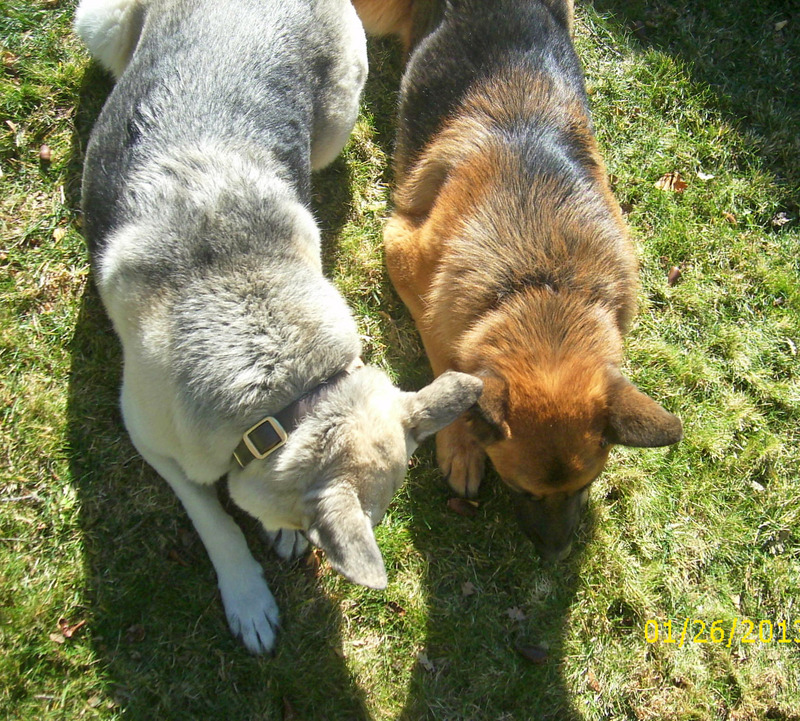 He and his companion Greta are inseparable by choice—when one gets in front of the other, the lead dog waits for the other to catch up—and this with a Greta that was an aloof German Shepherd before Katsu’s arrival. He goes to work every day with his mom, Joan, where he and Greta have their own private side yard off of Joan’s office. At home, he never lets Joan out of his sight. He has taught Greta how to be silly and play, including what she is supposed to do with fleece squeaky toys. He is a one-dog soccer team—throw a ball and he will chase, drop, chase, drop, over and over and over. Joan can’t get to the ball fast enough to throw it a second time. He knows his basic obedience commands, but I suspect he gives Joan a bad time by pretending not to understand. And he has learned that the inside cats are off limits (but he hastens to add that his contract says nothing about the pesky and annoying outside cats). OK, what do YOU think we’re supposed to do? Play with it or eat it? 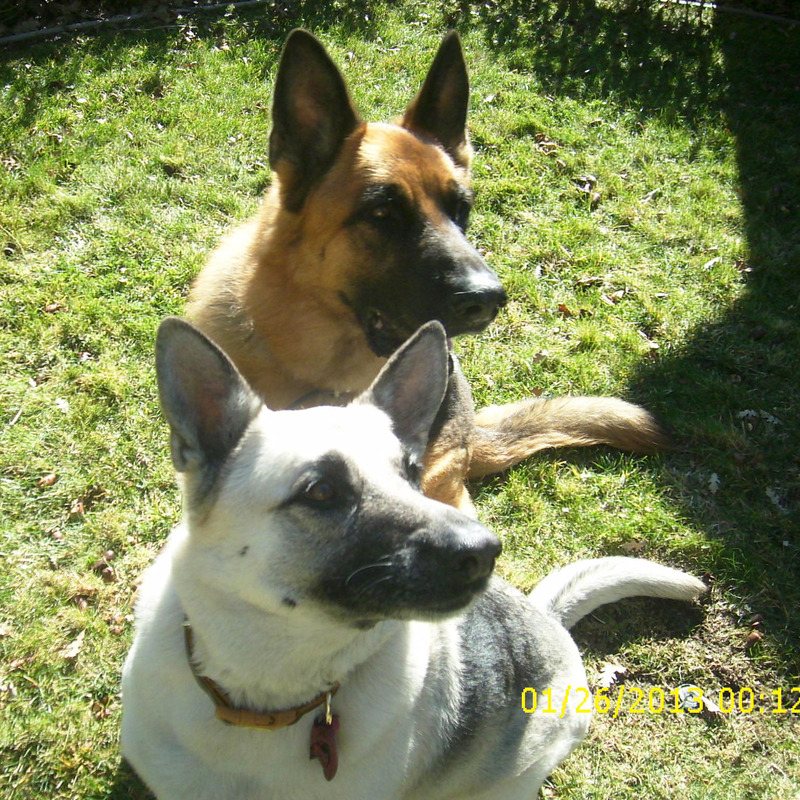 So for many of you, this probably sounds like a fairly typical feel-good story about one of our rescued German Shepherds. And it is a feel-good story, but to understand the true import and uplifting aspect of this story, you need go back only about eight months to see a starkly different Katsu. 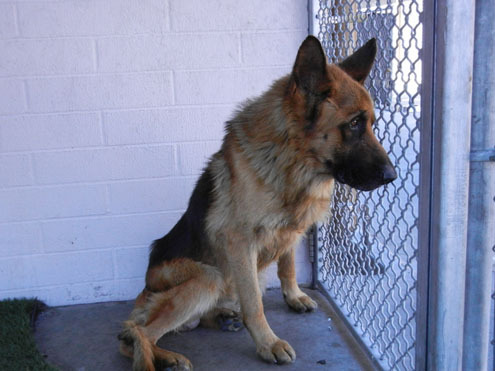 At that time, Katsu was in a barren cage at a LA basin shelter, having been turned in along with 14 other dogs by the owner of a Protection and Guard Dog Company. All of the dogs, including Katsu, were in horrible condition, having been neglected, abused, starved, and who knows what else, all in the name of making the dogs aggressive and making this guy some money. Katsu was emaciated, anemic, had a heart murmur, and could barely stand for a few minutes before collapsing. And he was deteriorating more in the shelter, but we could not rescue him because he was evidence in a criminal case and they would not release him. 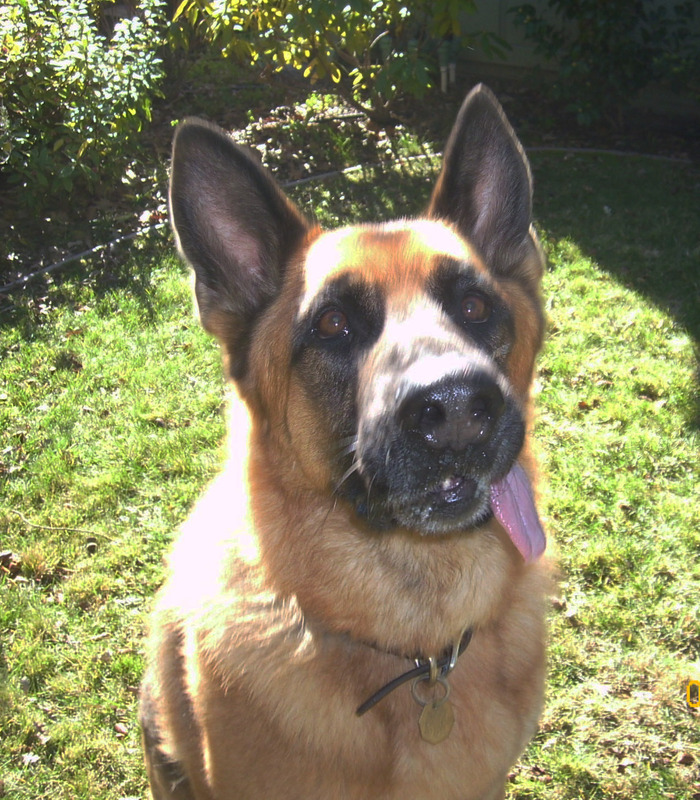 So Karen Barnes, our Thulani representative in LA and a senior volunteer with Westside German Shepherd Rescue, went into her ‘relentless’ mode. She move heaven and earth and finally was able to move the bureaucracy off ‘inflexible’. We brought Katsu (Japanese for ‘one who has overcome obstacles’) into the Thulani Program, got him under a vet’s care, began to put some weight on him, and to introduce him to what good life should be about (our best guess is that he spent most of his prior life in a small wire cage and likely had never known the feel of grass under his feet). He was estimated to be 12 years old so probably did not have much time left, but we were committed to making whatever time he had as good as we possibly could. 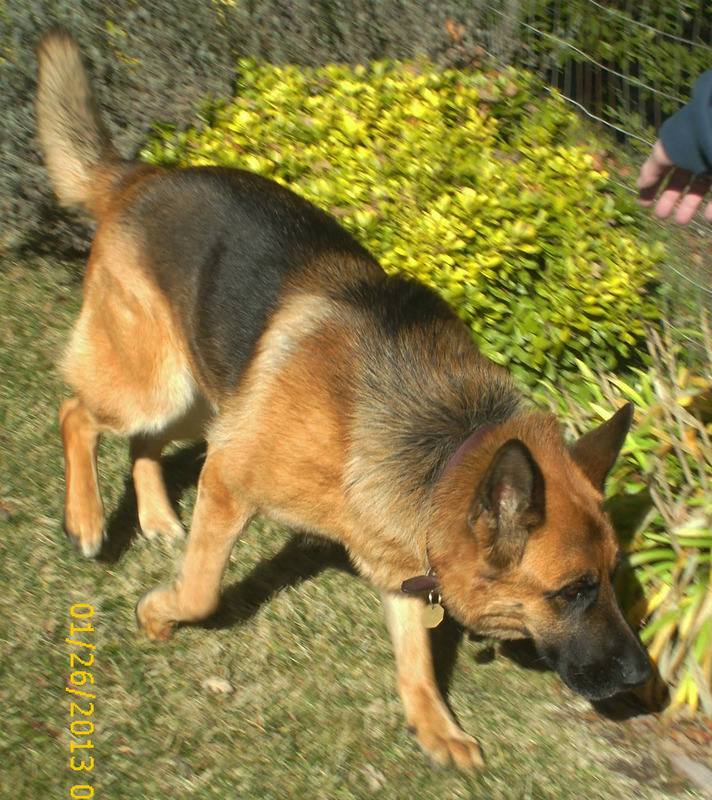 He stayed with Karen, moved into a new home with a fur-brother and fur-sister, and finally moved into his forever home with Joan. All the while, he was getting healthier, getting stronger, and learning to be happy. And his age estimate kept decreasing the healthier he got. But then disaster struck again. A raw sore in his mouth was found to be a very painful form of bone cancer in his jaw. The only alternatives were euthanasia or removal of the lower mandible. We opted for the surgery and he came though it beautifully, but the best news came later when we found out that the cancer was a type that does not metastasize. He just has to learn how to keep his tongue in his mouth so it doesn’t get dirty. Katsu is cancer free and doing spectacularly—just glance at the then/now chart below to comprehend what a fantastic transformation he has gone through. NOW…leaps through the rear window of an SUV, then leaps back out again!!! This is the Thulani Program at its best. For all of you who would like to get involved in this fantastic, uplifting program, contact Bob at Thulanidogs@gsrnc.org and prepare for an emotionl high like none you have ever experienced before. And Katsu’s story is about as wonderful a THANK YOU as anyone could hope for. CBG T. (no I don’t know what his name means either) has just been rescued by Karen from the LA Co Downey Shelter. 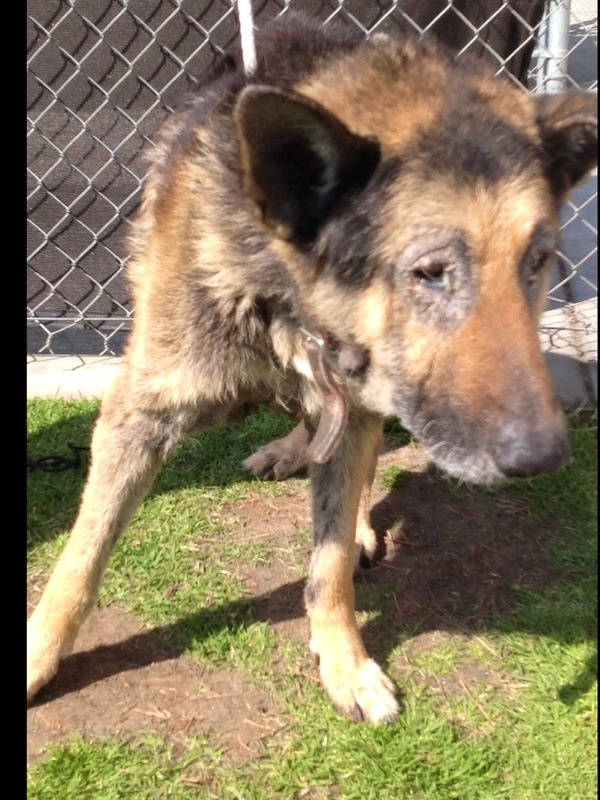 He is a sweet old boy who has been badly neglected but doesn’t hold a grudge. 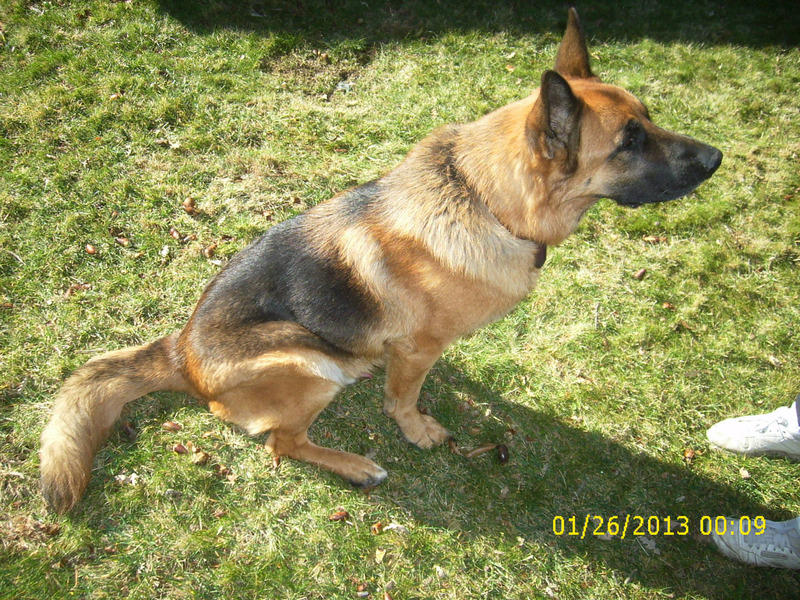 CGB is about 12 years old and in need of a lot of tender care and attention. His former owners let him get into very bad condition, especially his skin and coat, but we have treated similar cases, most recently see http://thulanidogs.org/2013/03/11/athena-t-lucky-to-have-been-dumped-at-a-shelter/ . We will make the rest of his life the best we cane. We still do not know a lot about CBG other than he needs medical attention, but we will post more as we learn about this great dog. As with all Thulani Program dogs, we will take care of him for the rest of his life, making sure that he has all the things he needs to have a quality life from here on. We will take care of his skin condition and find him a permanent foster home in which to live out his life. If you are interested in helping CBG, please go to http://thulanidogs.org/donate-2/please-help/ and follow the links to the donation page. If you are possibly interested in being a permanent foster home for CBG, please contact Bob at thulanidogs@gsrnc.org.